Hello! Welcome back friends! I’m so excited to get started on Valentine’s Day projects and I’m sharing my first with you today! 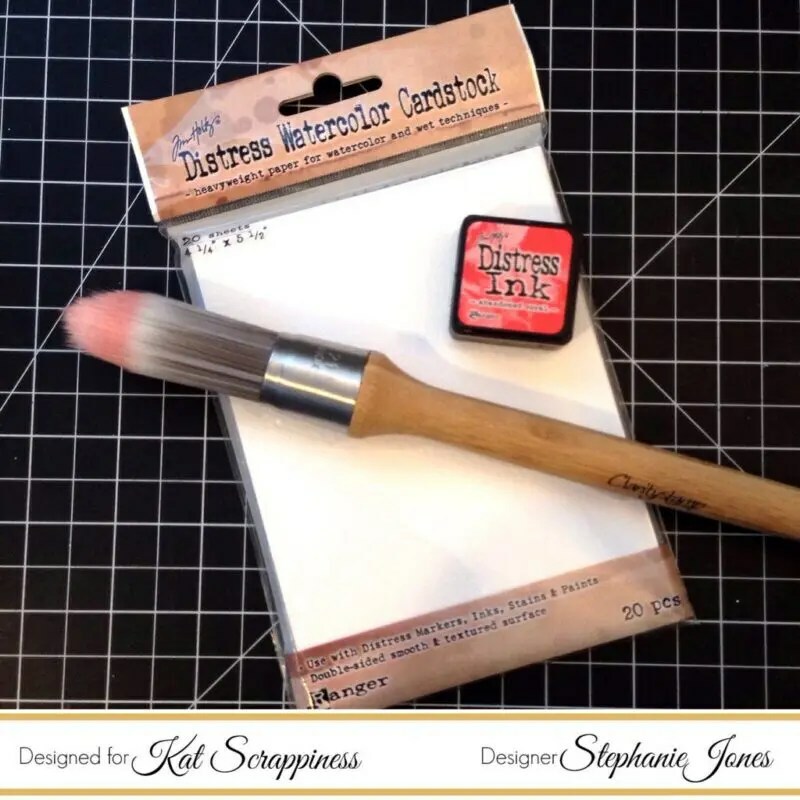 I have included a process video below along with some pictures and links to all of the products I used, which can all be purchased at KatScrappiness.com. I started out by doing a little bit of ink blending on some Tim Holtz Watercolor Card Stock using my new Clarity Stencil Brushes. I love the soft even finish you get when using these brushes. They’re going to be a game changer for sure! I used Abandoned Coral Distress Ink to add some soft color to my panel. Next I used this adorable stencil by C.C. 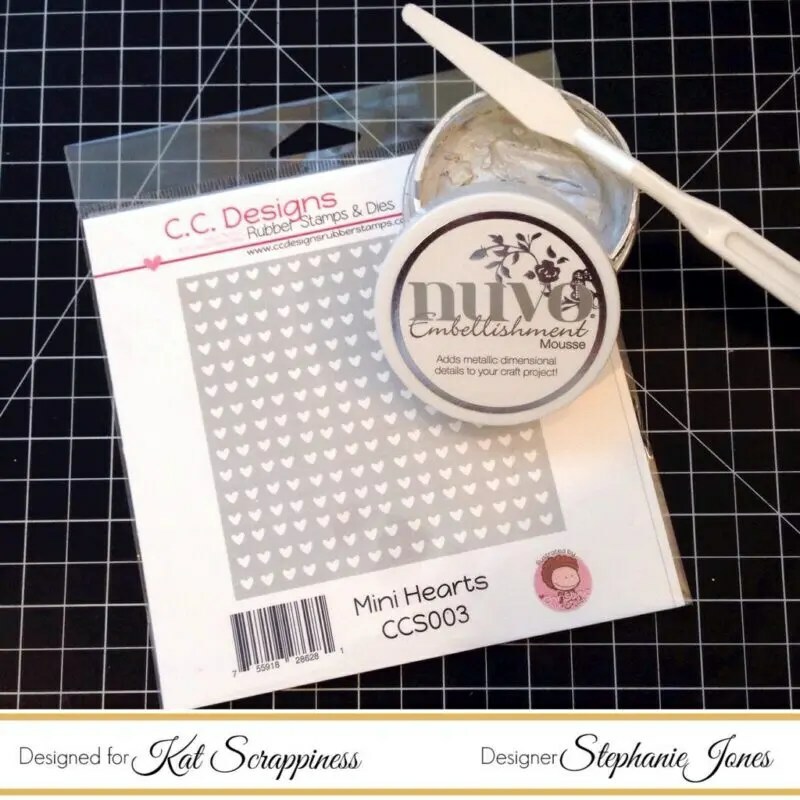 Designs called Mini Hearts and applied some Nuvo Embellishment Mousse over top, concentrating on the lower left corner of the card panel. 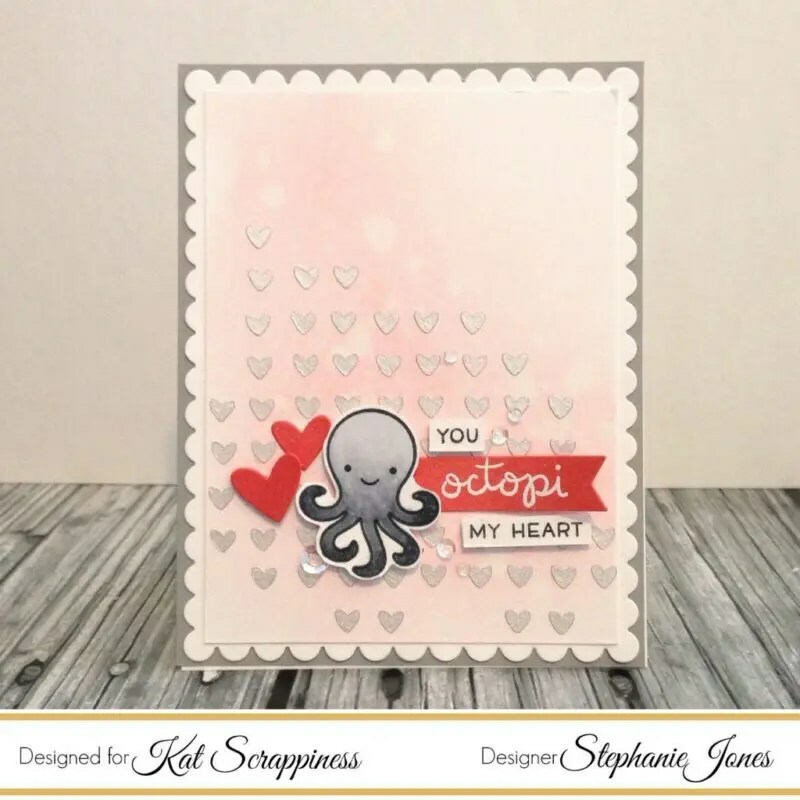 This new Octopi My Heart stamp set is absolutely adorable. I stamped it using my Memento Tuxedo Black ink and did some very basic coloring using my copic markers. 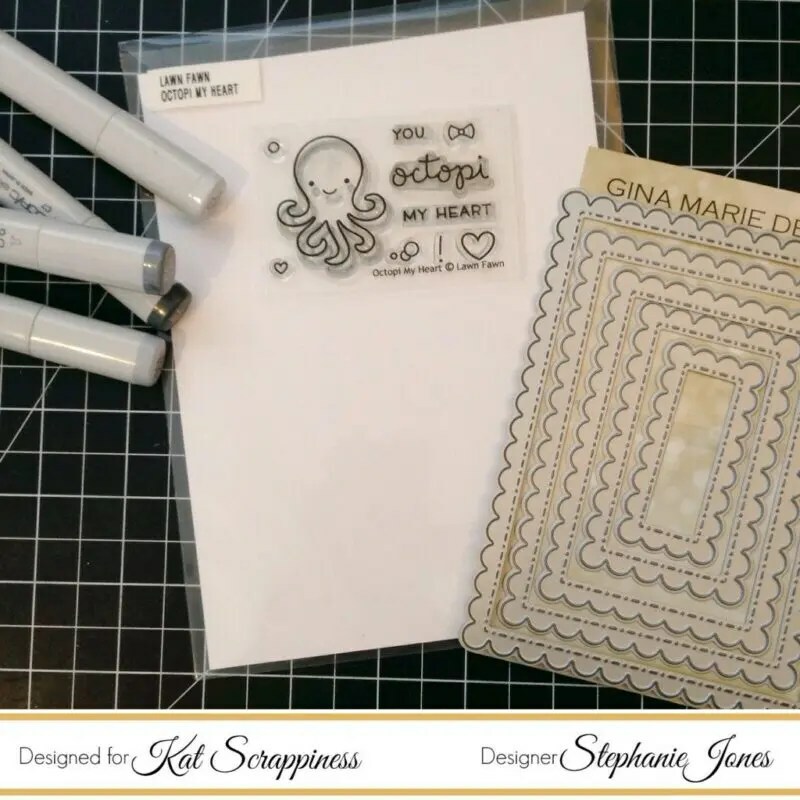 To assemble my card I cut a white layer using the Scalloped Stitched Rectangle Dies by Gina Marie Designs, along with some grey cardstock to layer behind that. I heat embossed part of my sentiment on some salmon cardstock and die cut it using the Everyday Sentiment Banner dies. The other part of the sentiment is stamped in blank ink on white cardstock and popped up on some foam tape for added dimension. 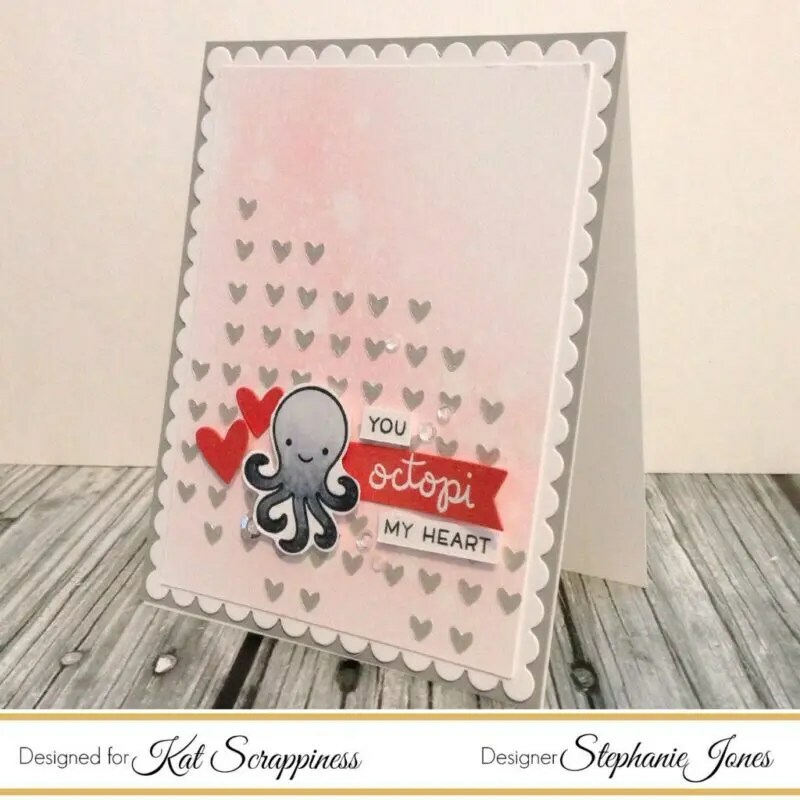 After attaching the Octopus I finished off the card by adding some White Diamond Sequins using my Crystal Katana tool, and added some Spectrum Noir Clear Glitter to the Octopus for some added shimmer. That completes card. 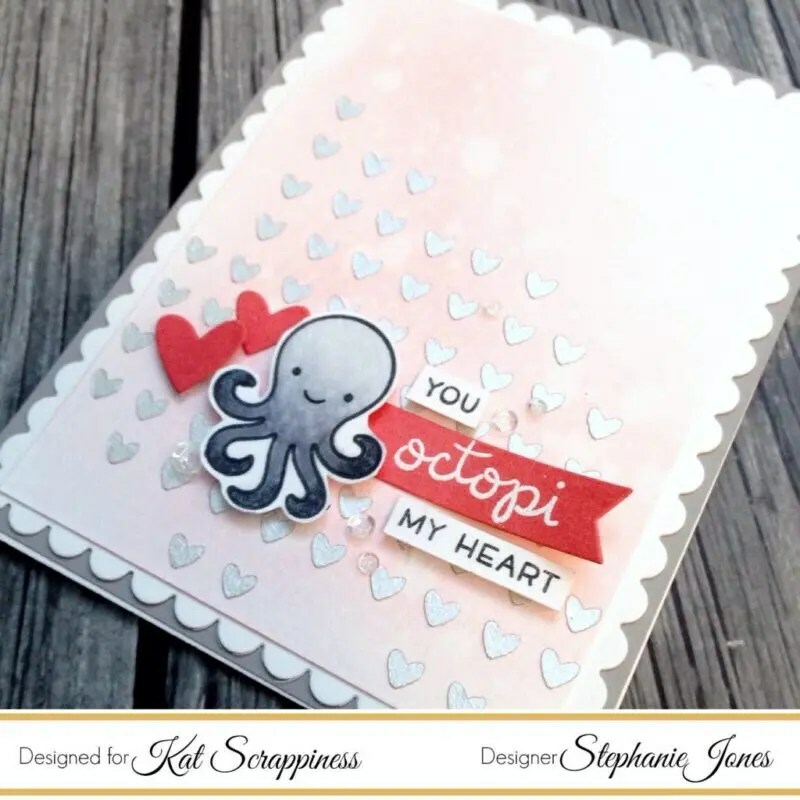 All of the supplies I used can be purchased from KatScrappiness.com and are linked down below. Thank you so much for stopping by!